The entry-level CD player market isn't virgin territory for Marantz. This machine's predecessor, the CD6002 was a real beauty, not to mention an Award-winner. Indeed, the NAD C545BEE knocked it off its perch. Can the CD6003 tilt the balance back in Marantz's favour? Suffice to say the CD6003 is a serious slab of kit and that £300 price tag appears more attractive the longer you listen to it. All the musical elements knit together to produce a hugely convincing, coherent sound. The Marantz follows all the sonic contours of a track without sounding laboured on the one extreme, or overbearing on the other. During the opening of Feeder's Tender, the rhythmic drumbeat, smooth vocals and natural piano play sounds enchanting. Spin the Theme From Jurassic Park and the Marantz connects with the listener in a way that its rivals struggle to match. The awesome musicality of the machine takes over, leading you on a dynamic, stirring journey. There's no sonic agenda, it concentrates purely on giving you a balanced, natural account of what's contained on the disc. As a result, you're encouraged to keep listening and plough through your CD collection. Before you hit play, press the ‘sound mode' button on the remote first. This disables the display and digital output and improves sound quality. The benefits don't immediately smack you round the face – it's not like hitting a bass boost button on a ghetto blaster – but listen for longer and you'll be able to notice a significant improvement in outright detail levels and dynamics. Build quality and styling are impressive for the money. The CD6003 mirrors the company's more expensive hi-fi separates with a chunky front panel curving away at the sides. As with the Denon DCD-710AE, the CD6003 provides you with a headphone output and iPod-compatible USB input. 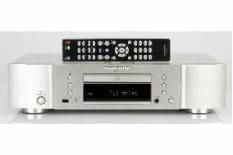 Our review sample had issues connecting to the iPhone, but Marantz assures us that this just requires a software update and that models already in the shops are unaffected. Marantz has clearly set its sights on designing one of the most capable and competitively priced budget machines on the planet. And the triumphant CD6003 is proof that it has succeeded.